So far I’ve shared with you four great books that I have found to be excellent references while on our dyslexia adventure. I’ve also shared with you twelve of the modifications and accommodations we have implemented for Anthony at school. Getting these accommodations were far from easy. All of my perspective, pointers and tips shared here come from a mom in the public school system in Texas. I know things can be different in each state. I share these things because I know some of this information can be really hard to obtain. It seems like you have to ask the right questions to get good guidance. I know there are parents out there who have no idea where to turn. I want to help in any way I can. When you’re ready to ask for accommodations for your child, I suggest you hold a meeting. 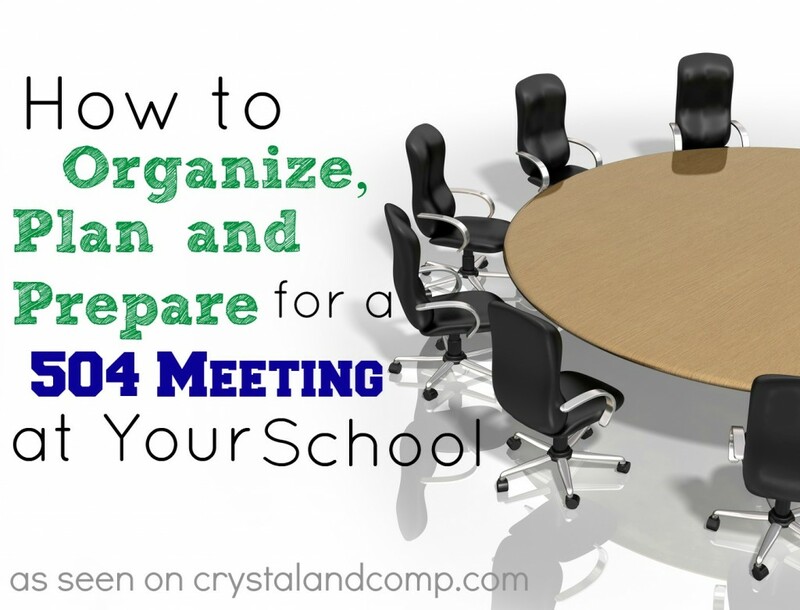 But before holding this meeting you need to be organized and prepared. When your child is given any diagnosis at school for any learning difference, or when you’re struggling with behavior issues at school, or if you are having issues with communication with a teacher or group of teachers, the first thing I suggest you do is make a binder. I have placed dividers in my binder with specific sections. Modify according to your needs, but here is a peak at what my binder looks like. Parent Teacher Conferences– this is where I store copies of all of our parent teacher conference documentation. You need to keep these in order to reference them in the future. 504 Related Documents– once you are given a dyslexia diagnosis, your student is now protected under something called Section 504 (also known as the Rehabilitation Act of 1973). This is a statute that is enacted by the United States Congress. Make a section in your book for all related paperwork- this is a key section. I will tell you more about 504 in detail in our next post. Report Cards– you need a place to keep all grading records and this binder is the best place. This way you have at-your-finger-access to your child’s grades during any meeting you attend. Scoring and Testing – any reports that you get or testing results can be stored here. This can include testing results directly related to the students learning difference. In our situation I store his dyslexia testing results as well as standardized testing results in this section. School Work Samples– you need a place to keep samples of work that show great progress as well as the samples that indicate your agreed modifications and accommodations are not being followed, should this become an issue. Behavior– any documentation related to behavior issues would be stored here. Notes– you need a place to keep flyers, notes and handouts that are given to you. Maybe you attend a local learning session about Dyslexia or you print stuff off on the internet or take notes in a parent teacher conference; you need a place to keep up with these papers. I also keep notebook paper in this binder so I can take notes at each meeting. Having this binder will help you stay organized, plan agendas for your meetings with the school, and will allow you to be prepared for the meetings you will have at the school. This is a great idea! My 1st grader has an IEP for OT issues. Thanks for sharing… and for stopping by my blog! I had a daughter in IEP's for her entire school career. 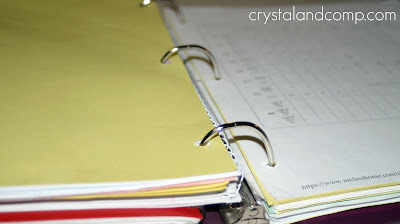 My binder was a huge resource and I was often more prepared and organized than the staff. I found it is very important to divide the binder by school year. Thanks for writing this blog post, it will help a lot of families out there! Wow- so nice to see a parent organized and helping their child! I taught at the high school level in Texas for 8 years and I went to many many 504 and sp. ed meetings. It is so sad when the parent isn't even in attendance! I certainly never met with any parents as organized as you! I would also suggest going to your BOE website and printing their policies regarding 504 or IEP's. Often times I find I tend to know more about it than the teachers/staff do during meetings and it helps to be able to refer them to the specific point in their own regulations. Great info ladies! I hope you find this information helpful and thanks for sharing your ideas as well. This is such a great thing to share! People need advocates and so many people go into this without any armor. What a nice post. I saw "504" and had to stop by! I've been to many 504 and IEP meetings! SOme days I miss being a SPED teacher and some days I don't! Keep up the great posts! Binder is ready to go for my meeting today! THANK YOU, THANK YOU for the tip!! Wish me luck!! I do wish you luck! I know how frustrating this process can be. So glad my tips for you were helpful! Thank you!!!! My 8 year old son has been in speech & OT since he was 1. Due to the red flags popping up early, we had a private testing done. When we registered for kindergarten and brought the evaluation, we were told that because he couldn’t read that he could not be diagnosed & they would not acknowledge it. We are now in 3rd grade and the school is finally agreeing to do their testing- which is just wasting more time as we already know what’s going on! The Coordiantor spoke with his teachers before school began to let them know we were trying to complete the testing. I had a conference with one of the teachers who told me that she felt my son was very smart & she was worried if he was given accommodations that he could possibly start manipulating the system & using them when he didn’t need to. She writes on his papers that he is being lazy, about his creative spelling, his answers have nothing to do with the question & if he didn’t understand why didn’t he just raise his hand. On his math tests , he has the math correct, but the constructed response can take him to a D as spelling, sentence structure & punctuation are wrong or he mixes things up when trying to write the answer. I am furious & I will make sure I have my binder ready when we go into this meeting! !